The Fast & Furious franchise has come a long way. 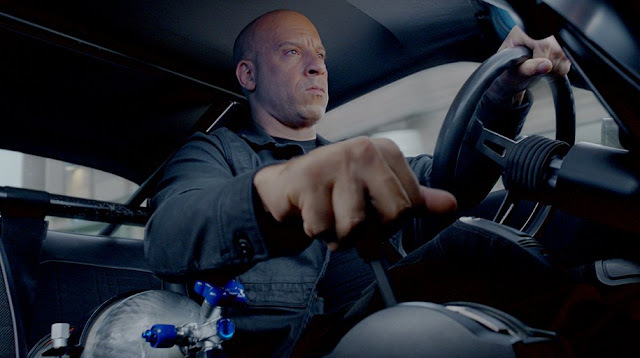 In the the first film sixteen years ago, Vin Diesel ostensibly starred as the villainous Dominic Toretto who, with his band of street racing criminals, stole DVD players off semi-trucks while driving Honda Civics. In the eighth inexplicably titled The Fate of the Furious (aka F8), journeyman filmmaker F. Gary Gray directs the international cast of super agents who must prevent nuclear war from a band of cyber terrorists. Franchise viagra Dwayne Johnson reprising his DSS Agent Luke Hobbs—who now spends his days coaching girls soccer games—has an expanded role after only a smaller turn the last timearound. He becomes the de facto leader of the crew when Dom mysteriously betrays his family to align with terrorist hacker Cipher (Charlize Theron) in her always in flight airplane. Theron is deliciously evil but lifeless mostly stuck behind a keyboard never being a true physical antagonist as she focuses on psychological warfare revealing herself as the architect of the previous two film's events. In a somewhat baffling move (even by this franchise's standards), Jason Statham's Deckard is now aligned with the good guys and works notably with Johnson's Hobbs to defeat Cipher despite having previously murdered a lot of people. Michelle Rodriguez as Letty gets more to do than ever with the absence of Paul Walker's Brian, Mia, Han, and Gisele. She's elevated to the main supporting character trying to piece together different motives and constantly moving plot devices. Tyrese Gibson and Ludacris, back as Roman and Tej, serve ably as predictable comic reliefs relishing their one-liners spouted to the out of place Nathalie Emmanuel who remains a relative newcomer to the team's antics. Kurt Russell continues to dial it up while saying his ludicrous dialogue with verve, but his lieutenant played by Scott Eastwood is painfully stilted as a new ally and team member. Things don't feel so durable anymore after of the loss of Walker, the riff between Johnson and Diesel, and constant stream of new elements added. F8 is needlessly bloated at a lengthy 136 minutes and feels derivative of lesser James Bond fare as Gray just is not able to bring balance to everything the way previous directors Justin Lin and James Wan were able to. The Fate of the Furious succeeds in refreshing the well-worn Fast & Furious formula, but it's just not entirely the same. The ridiculous fun and team aspect is largely in tact while the novelty of Diesel being separated from the group proves fairly compelling. However, Gray is only ever just barely able to hold all the pieces together making this one of the weaker entries and lacking the same energy as previous endeavours.